Welcome to the life story of Scotland’s national poet. Poetry and song are woven into Edinburgh Little Theatre’s biographical play about Robert Burns, which is alternatingly narrated by his sister Isabella, wife Jean Armour and Rabbie himself. We come to learn how his writing reflects a life of womanising, moving between professions and cities, and leaving his wife outrageously uncared-for. It may be a novelty to be welcomed into a play with a lunch of haggis, but the production is disappointingly straightforward from then on. Evidently it struggles to overcome the challenge of creating a compelling narrative out of an eventful life, leaving us with nothing to root for and little to invest in other than the promise of the next song. The incorporation of Burns’s work into the production however, is well done. ‘Scots Wha Hae’ is rendered particularly rousing, and ‘A Red, Red Rose’, one of Burns’s best known love poems, provides welcome playfulness. Characterisation is limited, however. It's difficult to stand and recite in character when there's little character to speak of, and this is very noticeable when there's a lot of standing around and reciting taking place. 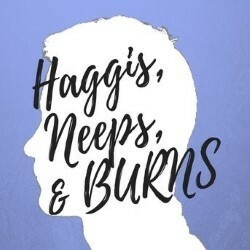 Haggis, Neeps and Burns lays out an episodic account of Burns’s life with an evident focus on providing context for his enduring poetry. It provides little subtext or interrogation, and despite the strength of its at times beautiful vocal performances, the production is flimsy and requires far more oomph from its cast and narrative to make it truly sing.